The Consumer Price Index (CPI) rose 1.2% on a year-over-year basis in July, following a 1.0% gain in June. Prices were up in six of the eight major components in the 12 months to July, with the transportation and shelter indexes contributing the most to the year-over-year rise in the CPI. The household operations, furnishings and equipment index and the clothing and footwear index declined on a year-over-year basis. Transportation costs rose 1.9% on a year-over-year basis in July, following a 0.6% increase in June. Gasoline prices contributed most to the gain in prices, as well as to their acceleration, rising 4.6% in the 12 months to July, after posting a 1.4% decline in June. The purchase of passenger vehicles index increased 0.2% year over year in July, after declining 0.2% the previous month. At the same time, passenger vehicle insurance premiums rose at a slower rate in the 12 months to July than they did in June. The shelter index increased 1.3% year over year in July, after rising 1.6% in June. Homeowners' replacement costs contributed the most to the gain in prices, rising 4.1% in the 12 months to July. Prices for natural gas (+9.7%) increased at a slower year-over-year rate than they did in June. Meanwhile, the electricity index recorded its largest decrease since April 2003, down 9.1% year over year in July, following a 5.3% decline in June. The decline at the national level largely reflected legislated price declines in Ontario. Consumer prices for food rose 0.6% on a year-over-year basis in July, matching the gain in June. The health and personal care index increased 2.2% in the 12-month period ending in July, its largest gain since May 2011. This increase is partly attributable to the non-prescribed medicines index, which grew 4.4% on a year-over-year basis in July, after a 1.2% increase in June. In July, the household operations, furnishings and equipment index declined on a year-over-year basis for the first time since August 2006, down 0.1%. The furniture index contributed the most to this decline, down 2.9% in the 12 months to July. The telephone services index increased 0.1% year over year in July, after rising 2.0% in June. On a monthly basis in July, telephone services prices fell 1.8%. Prices for household appliances (-2.0%) declined less, year over year, in July than in June. Clothing and footwear prices decreased 0.1% in the 12 months to July, after a 1.7% decline in June. 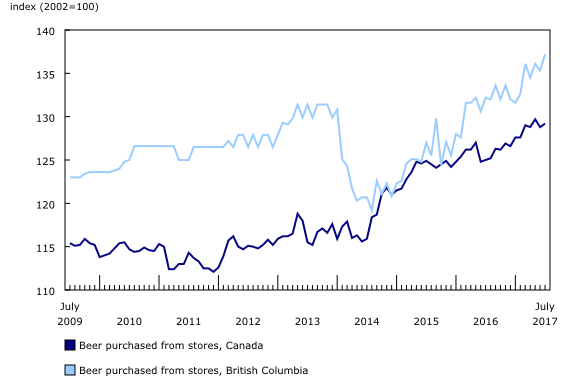 Prices for men's clothing and women's clothing declined less on a year-over-year basis in July than in June. At the same time, prices for footwear rose 1.6% in July, following a 0.3% increase in June. Consumer prices rose more on a year-over-year basis in seven provinces in July than they did in June, while they decelerated in three. The deceleration in Newfoundland and Labrador and in New Brunswick partly reflects the ending of the 12-month period that followed the increase of the Harmonized Sales Tax in July 2016 in these provinces. 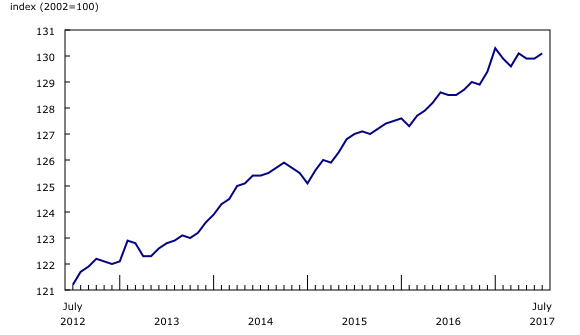 In New Brunswick, the CPI increased 1.4% on a year-over-year basis in July, after rising 2.0% in June. The purchase of passenger vehicles index rose less in the 12 months to July (+0.2%) than it did in June (+1.4%). Food purchased from restaurants rose 1.0% in July, after rising 3.1% in June. 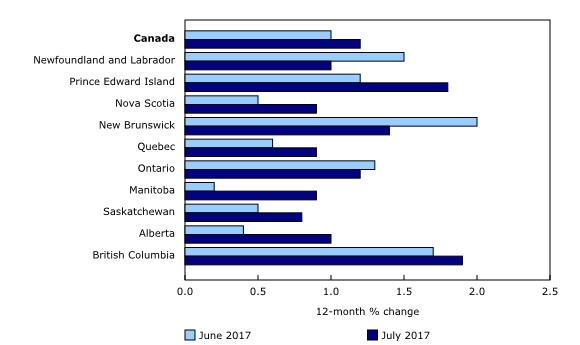 Traveller accommodation costs in New Brunswick rose 24.3% in the 12-month period ending in July, the largest increase on record; this price growth is partly attributable to additional demand observed throughout the Maritime region in recent months, and may also be influenced by celebrations of, and travel related to, Canada's 150th birthday. The CPI in Ontario was up 1.2% in the 12 months to July. Homeowners' replacement costs contributed the most to this growth, up 6.3% year over year in July, the smallest gain since July of last year. Among the provinces, year-over-year growth in the prices for fresh fruit accelerated the most in Ontario. Electricity costs fell 25.5% on a year-over-year basis in July, mainly reflecting the effects of the Ontario Fair Hydro Plan Act. While the gasoline index was the main contributor to the acceleration in the 12-month change in consumer prices at the national level, its impact was greater in the Prairie provinces. It partly reflected large monthly declines in July 2016, as gasoline prices adjusted following supply disruptions in the previous months. On a seasonally adjusted monthly basis, the CPI increased 0.2% in July, after posting no change in June. In July, five major components increased on a seasonally adjusted monthly basis, while two decreased. The recreation, education and reading index was unchanged. On a seasonally adjusted monthly basis in July, the clothing and footwear index (+0.5%) posted the largest gain, while the household operations, furnishings and equipment index (-0.2%) posted the largest decline. The growing popularity of craft beer among Canadians reflects changing consumer tastes, as craft beer is generally associated with a wider variety of flavours. Even with all this popularity, there are still some large regional differences. In British Columbia, craft beer sales accounted for 18% of the beer market in 2014, the largest share among the provinces. Small-scale breweries in the province posted sales increases of approximately 50% from 2014 to 2015 (source: Agriculture and Agri-food Canada). Over the course of 2014, prices for beer purchased from stores fell almost 8% in the province, while they rose over 4% at the national level, reflecting, perhaps, this increased market competition. Other provinces that have a fairly large craft beer presence are Quebec and Ontario, which have recorded slower price growth from July 2009 to July 2017 than provinces with a smaller craft brewery market share. Over this period, Quebec beer prices increased 2.5%, while those in Ontario rose 9.1%. At the national level, beer prices rose 12.0%. 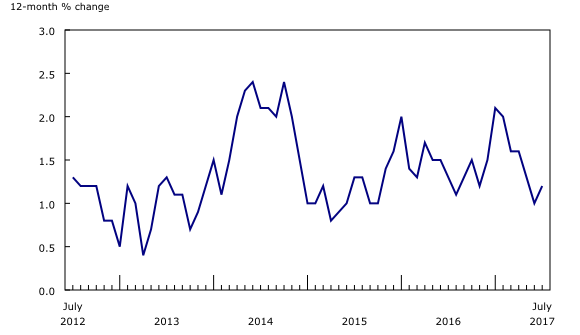 A new article, Inflation in Atlantic Canada fuelled more by oil-linked products, is available in Analysis in Brief (Catalogue number11-621-M). A seasonally adjusted series is one from which seasonal movements have been eliminated. Users employing Consumer Price Index (CPI) data for indexation purposes are advised to use the unadjusted indexes. For more information on seasonal adjustment, see Seasonally adjusted data – Frequently asked questions. The CPI measures the change in prices of consumer goods and services over time. In order to accurately reflect changes in the market and in the behaviour of consumers, Statistics Canada periodically reviews and updates the methods applied to the various components of the CPI. The release of the August 2017 CPI (to be published on September 22, 2017) will mark the implementation of a new gasoline index methodology. The gasoline component represents 3.37% of the 2015 CPI basket at link month (December 2016) prices and is part of the transportation index, one of the major CPI components. The gasoline index methodology changes consist of two main elements: collection of prices in more cities and over more days of the month (every business day); and a new aggregation formula. The indexes for each geographic stratum will use an explicitly weighted Jevons index formula. The population count for each city, drawn from the census, will be the source for weighting. Real-time CANSIM table 326-8023 will be updated on September 5. For more information, consult the document Real-time CANSIM tables. The CPI for August will be released on September 22. 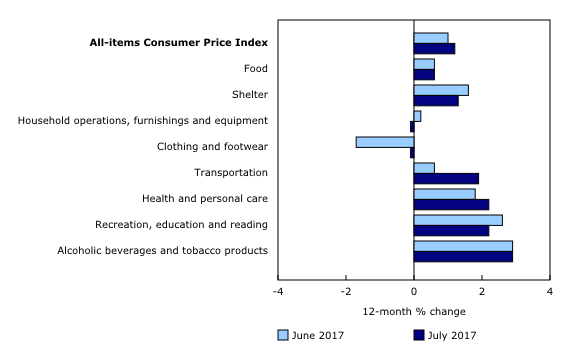 The July 2017 issue of The Consumer Price Index, Vol. 96, no. 7 (Catalogue number62-001-X) is now available.